271 May 1949. June 1949. 1st attached article Temperance Union Will Observe Diamond Fete The diamond jubilee of the Women's Christian Temperance Union will be observed at a meeting to be held in the North-Side Friends' church Sunday at 3 p.m. The state W.C.T.U. president, Mrs. Gertured Walton of Des Monies, will be principal speaker. Preceding this meeting at 2:30 p.m. in the same building, Loyal Temperance Legion will hold a speech contest. 2nd attached article May 15 Temperance Union Celebrates Jubilee A near capacity audience at the North Side Friends church on Sunday afternoon listened to the speeches of the L.T.L. speech-contest prize winners and watched the demonstration put on by Miss Lela Tobridge of Oskaloosa, state scientific temperance instructor. The program was held in observance of the Dimond Jubilee of he Woman's Christian Temperance Union. 3rd attached article Mrs. John Evans was hostess Tuesday to tot he Woman's Christian Temperance Union. Devotions were led by Ada Park who also presented the lesson on the topic "Child Welfare Around the World." Mrs. Evans who is vice-president of the organization, presided in the absence of Mrs. A.W. McBlain, president. Reports were given on the Diamond Jubilee of the WCTU which was held Sunday afternoon at the North Side Friends Church. 4th attached article Mrs. John Evans Died Suddenly Tuesday Afternoon Mrs. Tilla Sulser Evans, widow of the late John Evans, who preceded her in death five years ago. died quite suddenly Tuesday afternoon of a heart attack in a local hospital, where she had been patient since Monday. She had not been considered seriously ill. Mrs. Evans was sister of Mrs. P.H. Pilgrim and the late Wm. Sulser. She is survived by two children, Harold Evans of Des Moines and Mrs. Jack Hall of Livermore, near Fort Collins, Colo. Funeral services in charge of Rev. Leland W. Mann will be held in the James Funeral home Friday at 2 p.m. Burial will be in Hazelwood cemetery. The WCTU met May 17, 1949 with Mrs. John Evans, who also presided. The treasurer's reporter was read. The offering of $23.55 was received at the Diamond Jubilee Meeting which was held a preceding, Sunday at the North Side Friends' Chruch. The treasurer had paid 89C to Mrs. Allen for supplies for LTL. $47.52 on hand May 17th. Nellie and her mother, who had been attending the Golden Wedding for Mr. and Mrs. A.B. Marson, brought napkins on the corner of which were the gold letters of the names of the couple. Adjourned, Ada Park, Secy. 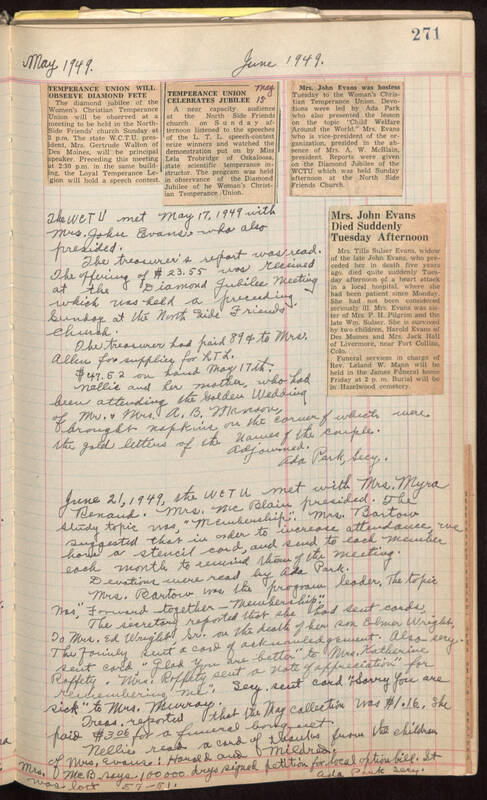 June 21, 1949, the WCTU met with Mrs. Myra Renaud. Mrs. McBlian presided. The study topic was, "Membership". Mrs. Barton suggested that in order to increase attendance, we hone a stencil card, and send to each member each month to remind them of the meeting. Devotions were read by Ada Park. Mrs. Barton was the program leader. The topic was, "Forward together - Membership." The secretary report said she had sent cards, to Mrs. Ed Wright, Sr. on the death of her son Elmer Wright. The family sent a card of acknowledgement. Also very sent card, "glad you are better" to Mrs. Katherine Roffety. Mrs. Roffety sent a note of affection "for remembering me". Sery. send card, "Sorry you are sick" to Mrs. Murray. Fees reported that the May collection was $1.16. She paid $3.06 for a funeral burial. Nellie read a card of thanks from the children of Mrs. Quaus: Howard and Mildred. Mrs. Me B says 100000 drys signed petition for local option bill. LT was lost 57-51 Ada Park Sery.